I love a good visual. The chart to the left shows my jaggy progress toward reaching my fitness goal. 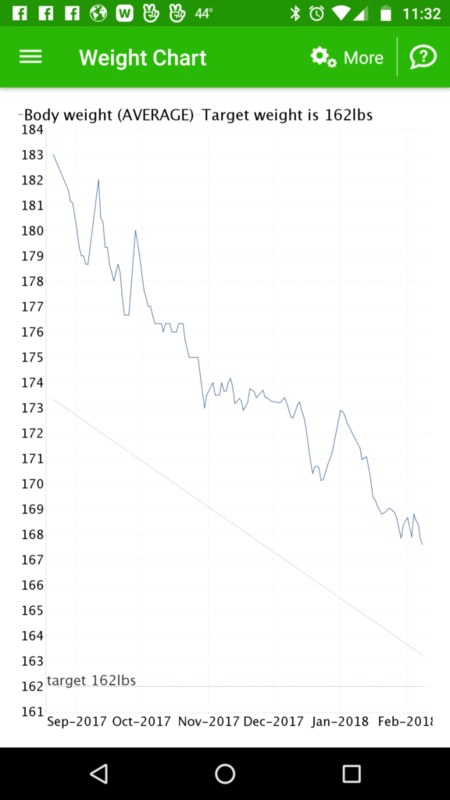 It’s been over a year since I started tracking my weight loss on this app. It’s nice because I can keep track of calories and exercise, but this feature is my favorite part: Seeing the result of all my hard work over time. We’re going to Seoul, South Korea for two weeks in April. Seoul’s a very active city, not just with getting from place to place, but with all of the amazing mountain trails to hike. So I felt I needed to get in better shape and build endurance for all of the climbing we intend to do. Other progress… Let’s see. I finished reading Everything I Never Told You, by Celeste Ng. I published a short review of this exquisite novel here. I started re-reading The Left Hand of Darkness, by Ursula K. Le Guin, and added Call Me By Your Name, by Andre Aciman to the queue. 2018 is already so much better in terms of quality books than 2017. Writing-wise, sadly, I did not get Don’t Touch published in Coffin Bell Magazine, but I’ll keep trying. That’s the fourth submission for that story, and it’s kind of a straight-up horror so… we’ll see. Finally, my writing progress for this week: I finished two chapters for the new story I’m working on, with a word count total of 2,865.